The entertainers were fantastic, very professional and a pleasure to work with. Only a few hours to prepare but still delivered a brilliant performance. I would recommend working with Juggling Inferno to anyone. 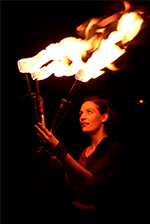 We booked Juggling Inferno's party entertainers for our anniversary celebration. From the booking process to the entertainment itself their service was professional and enthusiastic. Highly recommended! The entertainers were truly amazing! - Unique, mesmerising and impressive! Thoroughly enjoyable and would recommend to anyone hosting a corporate event. The fire shows were brilliant. The performers appealed to all ages and worked like a magnet drawing large crowds who could have watched all night! I just wanted to say thanks to you, for such a great evening. 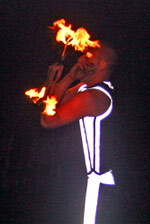 All the fire and glow performers were thoroughly chilled, professional, and above all - very entertaining! Exactly what was needed. Tim performs with one then two then three and then four burning staffs!! Its so amazing you don't really think anymore - you just watch! We have some pictures of the audience during the show - they are entranced. The reception was rapturous. A true showman - spectacular effects, but made to look easy. The fire show was so stunning, people did not realize what they had seen until it was all over. Thanks Tim for a spectacular show - you were generous with your time, and daring in your achievement. Your performers were great and we would happily use you again. Thanks you for all your hard work. A small crowd and difficult conditions demand maximum performance ability. Tim delivered with an amazing fire show. I just wanted to say thanks for the fire eater's performance. It provided a fantastic surprise to our guests! The performance was great, he was very professional, very friendly and very likeable. I would highly recommend him to anyone. "p.s. We even bumped into someone on a flight who had seen him in Manchester the following night, and they commented on how good he was at a travel company agents annual do!!" It was fantastic to deal with their professional team and we were as amazed as our guests on their breathtaking performance. Just a quick note to say thank you. 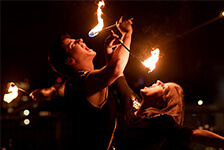 The fire and glow jugglers were great, and a special thanks to the young lady who was outside in the freezing cold, her fire-eating and juggling created a great entrance to the event. From start to finish, dealing with Juggling Inferno was a breeze, a very friendly and personal service. The show was truly amazing and added an extra dimension to our summer ball. As for the mind-bending tricks from the magician… I'm still baffled! Thanks for a first class performance. Thank you for providing the entertainers for our campaign. The event went very well despite the pouring rain. You and your performers drew in a great crowd and helped us get our message over. Tim came to my wife's 40th birthday party at short notice and did a great job. As everyone arrived he greeted them with an impromptu display of some of his fire skills (people were particularly impressed with his "body burning and fire eater" tricks) as well as some friendly words. Then, as darkness fell, he performed for us for 20 minutes, finishing off with a spectacular fire-breathing trick that had everyone cheering. Tim is professional, friendly and really keen to make sure his customers get their money's worth. We certainly did! Have we fired up your interest? Contact us now to find out how we can set your event alight, fire up your guests, and create magical memories of your special day!! We look forward to receiving your enquiry. © Juggling Inferno 2015. All rights reserved.